With only one and a bit sleeves and the belt to go, I seem to have come to a halt on this. I just don’t feel like working on it at the moment. Silly really because with a couple of evenings work it could be finished, and I am really pleased with the way it is turning out. It’s a throw in stocking stitch with a garter stitch border. I’m making it for one of my sisters. She bought the yarn ages ago, but never got round to making it. She wants it to be large, and I’m aiming for about 5 feet x 6 feet. It’s just over half way there at the moment. I actually quite enjoy working on it as it’s mindless knitting, good to work on whilst watching a film, but the cotton sheds alot, so I end up with white fluff over my clothes. I have made another throw with this yarn, and that stopped shedding after it was washed, so I will be putting this into the washing machine before giving it to my sister. 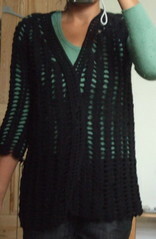 I have also started a new project – a crocheted cowl neck round yoke sweater. I have now just finished the neck and am onto the yoke. 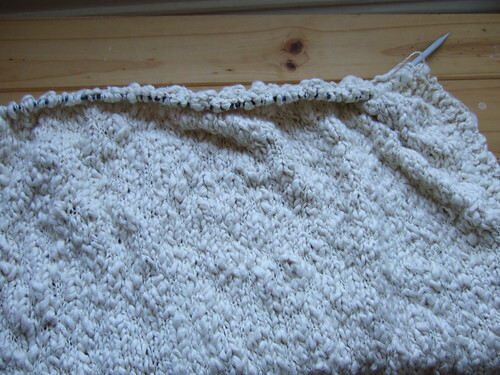 I’m using an aran weight mohair blend yarn (sirdar blur) with an 8mm hook, so it should be a fairly quick project. I’m also trying to finish the trekking sock from my last post. hopefully by the next time I post, I will have finished at least one of these. Oh! Just soldier on and finish that black sweater! Probably, because it’s black and difficult to see the stitches is why you’re at a standstill. I know that I work much faster when my yarn is stripey and fun. HOWEVER, a simple black cardigan is well worth the work! Can’t wait to see the finished sweater! 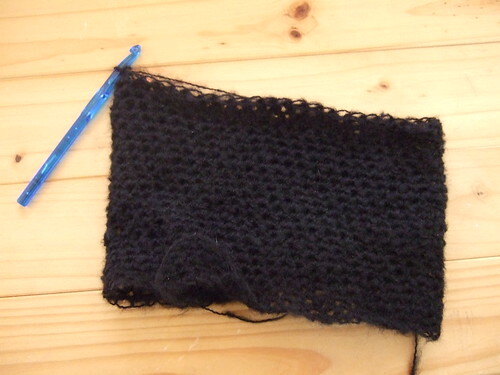 I think your are right – I find black difficult to work with, but keep buying black yarn! Thanks for the encouragement! – I am now storming through the sleeves, and will post a photo of the finished cardigan at the weekend.